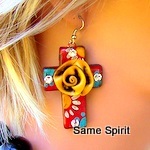 Much of our jewelry is created by Artist, Amy Michelle. Amy and her mother make every piece of jewelry. 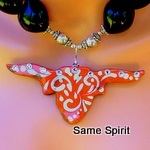 Each piece is made with clay and handpainted, so no two will be identical. Every rose is made by hand, blending clay colors and then handforming each single rose into a one of a kind work of art. 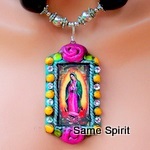 Most of the pieces are accented with Swarovski crystals. Pendants have a S-hook application. This allows you to add it to your favorite necklace or create a new look by layering chains, pearls, beads or a simple leather band. This fun pendant has a S hook application. 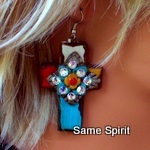 Add it to your favorite beads, pearls or chain for a new look! 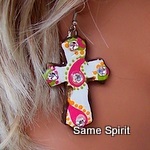 This beautiful pendant has a S hook to fit any necklace. Add it to a cord, layers of pearls, chains or a combination of all.